After you publish an article, what happens next? If you’ve published really great, newsworthy content, journalists should write about it, people should share it on Facebook and Twitter, and it should generate customer leads. But the Internet is such an enormous, busy place that most likely no one will notice. The majority of articles published by companies never reach anyone. So the time you spend on content marketing ends up being wasted. The problem is that making something great isn’t enough. Distribution matters. How do you get the world to notice the work you’ve done? 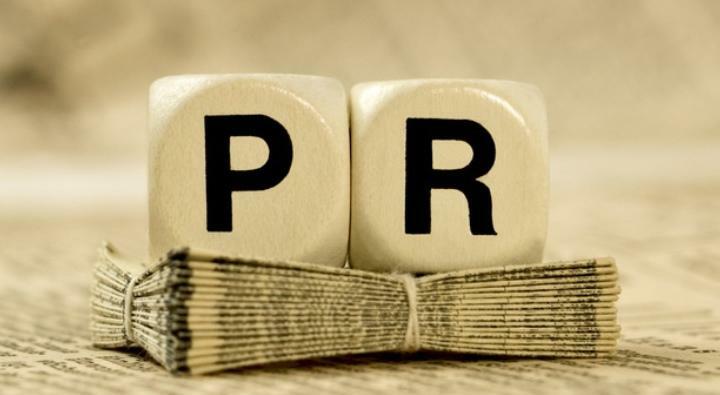 Most companies need to hire a PR agency to get their content marketing to spread. Many agencies are great, but their costs start at about $10K a month, and hiring even the best public relations team can’t guarantee results. The clients of the Priceonomics Data Studio, however, have seen their articles go viral and generate customer leads without hiring a PR firm. We’ve seen content marketing work for companies who can’t pay tens of thousands of dollars on distribution. The key is that if you make great content marketing based on your company's data and information, it’s much easier to get press about your company. You can do it without a PR firm, and you can do it even if you’re a still-unknown startup. In fact, we think you can do it for about $200 / month. Today, we’re launching the Priceonomics PR “Agency.” We’re putting agency in quotes because it’s a set of software tools that help companies promote their content marketing. You simply provide us with an article you want to spread, and we’ll provide you with a targeted list of journalists who actually cover this topic and software to help you manage the outreach process. To spread great content marketing, a $10K per month PR agency is simply overkill. So, we built a $200 / month agency that’s geared for this task. If you’re interested learning more about it, send us a message here or keep reading below. Write about information. Make it good. Have a plan for distribution. In working with clients of our Data Studio, we’ve noticed there are “haves” and “have nots” when it comes to getting press. Companies that can afford the PR agencies that can make content spread, and those that cannot. The “haves” can afford to keep a PR agency on retainer, or they have an internal PR person on staff. When these companies publish a new article (or commission Priceonomics to make them one), the PR companies work their press relationships to try to get the article “placed” in a top tier media outlet. If the content is great, it normally works. The “have nots” don’t have a PR agency or internal PR person. After they publish an article, they often shirk the work of content distribution. Or, they haphazardly spam journalists whose contact information they purchase from a stale database. The journalists typically don’t cover whatever the company is pitching, and they ignore the spam. For the “have nots,” content marketing ends up being a waste. They spend time producing great content, but they don’t have the skills or time to spread it. So, we expanded our services to help our clients spread their content so the “have nots” could still get good outcomes for their content. You see, there’s a quick hack for companies that can’t afford to hire a PR agency: build a very targeted list of journalists who actually care about the topic you’re covering and email them about your article. If your article is relevant, 1-5% of the journalists you contact will respond and cover you. But spreading content marketing this way takes an enormous amount of unpleasant “schlep” work. Not only does the piece of content have to excellent and newsworthy, but you need to find out who exactly would write about. You have to do recent searches to see who’s covered the topic of your article. If you mention a city in your content marketing, you have to find local reporters. You have to track down journalists’ email addresses. You need some judgement about which kinds of journalists will cover this topic and which won’t. That’s where the Priceonomics PR “Agency” comes in. Just submit an article to us, and we’ll provide you with a custom list of journalists, proof they write about the topic of your article, and the best email address to reach them at. 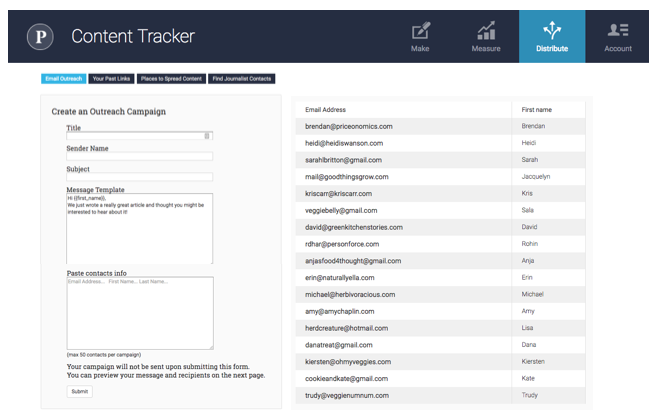 Additionally, we’ll provide you with easy to use software we’ve built to automate and manage the process of email outreach. Building targeted lists of journalists is a difficult skill to acquire, but once you do it enough, you learn how. So, we’ve built up a team that does just that: reads your article and then comes up with fresh lists of journalists who cover your topic. We don’t pull it from an ineffective database. Instead, the team manually searches for articles to build your custom list. The output you get is a spreadsheet that you can load into our PR automation software to manage the process of journalist outreach. If you prefer, you can instead manually email journalists or load the information into any outreach software program. We can get you outreach lists for any topic you want. Although, obviously, writing about more interesting topics increases your odds of garnering press coverage. If you use our PR automation software, you simply authorize your Google Apps account with Priceonomics Content Tracker. It can automate the process of emailing journalists—although to prevent abuse, you’re limited to emailing 50 contacts at a time. The software is simple to use. 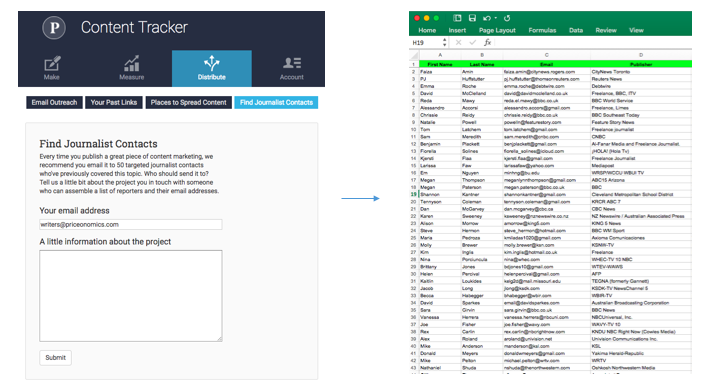 You write your message once, copy and paste in the contact info of who you’re trying to reach from the spreadsheet, and hit send. Messages will be individually sent via your Google Apps email account. During our time working with companies on their content marketing, it’s become clear that the biggest problem companies face is “distribution.” PR companies are really the only option out there, but they are expensive. Another problem is that the kind of pitching PR companies do isn’t geared toward spreading content marketing. The traditional PR model seems geared towards pitching articles only to outlets they have deep relationships with. If you want a big name magazine to write an article called “Inside [Name of your company], the Company Disrupting the World!” that’s what a good PR firm can do for you. The reality is that if you make a truly great piece of content marketing based on your company's information, then pitching it to ten outlets isn’t enough. There might be a thousand places that would cover your analysis. If the content is good enough, it will make a splash in the press if you just make sure they find out about it. Spending $10K per month on a agency with deep relationships with a few press outlets is not the right solution for spreading content marketing. The Priceonomics PR Agency starts at $200 / a month, and you can cancel anytime. It’s currently in beta. If you’re interested in becoming a customer, send us a message here. Cover image via flicker user Nution may. Image partially cropped.